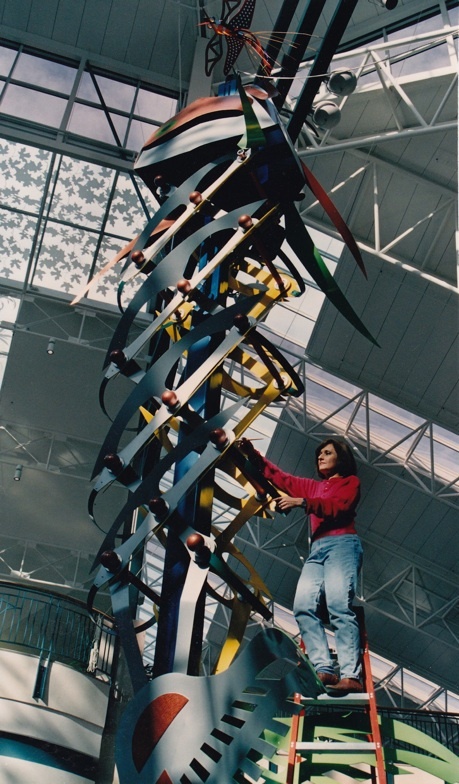 Chicago based artist, Christine Rojek, specializes in public sculpture and uses the tenets of fine design to create interactive environments that appeal to a wide audience. Her installations can be provocative, theatrical, or whimsical and have become destination pieces in over 25 locations throughout the United States. Rojek earned a Bachelor of Fine Arts from the University of Illinois at Urbana-Champaign and continued her studies at the American School of Art in Fontainebleau, France where she focused on both performance and installation art. Rojek has received widespread recognition for her achievements, including several fellowship grants from the Illinois Arts Council, the National Endowment for the Arts, and an AT&T Technology in Art Grant. She is currently producing a wind-activated sculpture for “Sculpture on the Grounds”, a national competition sponsored by the Evanston Art Center. When she is not creating sculpture, Rojek teaches at Columbia College Chicago and is the co-founder of SculpTours, an exhibition and touring company that promotes the appreciation and advancement of sculpture in Chicago.